Looking down upon a restaurant along the Breakneck Stairs and the Quartier Petit Champlain in Old Quebec City, Canada, the night lights illuminate the beauty of the historic buildings. The Breakneck Stairs are the oldest stairway in Quebec City dating back to 1635. Once wooden, renovations to the stairs took place in 1968, changing the Breakneck Stairs into an iron stairway. The legendary Breakneck Stairs are known as l'escalier Casse-Cou to the French people, which translates to "pathway, place where we may fall down". Visitors to the Quartier Petit Champlain, read over a menu outside a restaurant where they can enjoy a romantic dinner while watching over the quietness of the historic street. 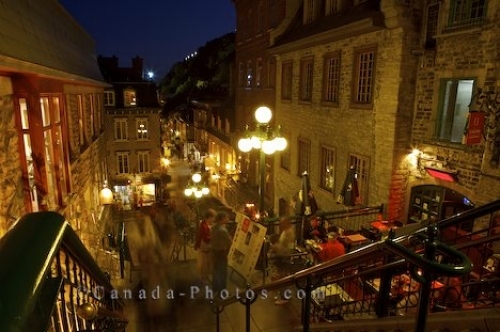 Photo of a restaurant and the Quartier Petit Champlain in Quebec City, Canada along the historic Breakneck Stairs. ... and Petite du Champlain seen from the top of the L'escalier du Casse-cou, Breakneck Stairs, Quartier Petit Champlain in Old Quebec, Quebec City, Quebec, Canada. UNESCO World Heritage Site.